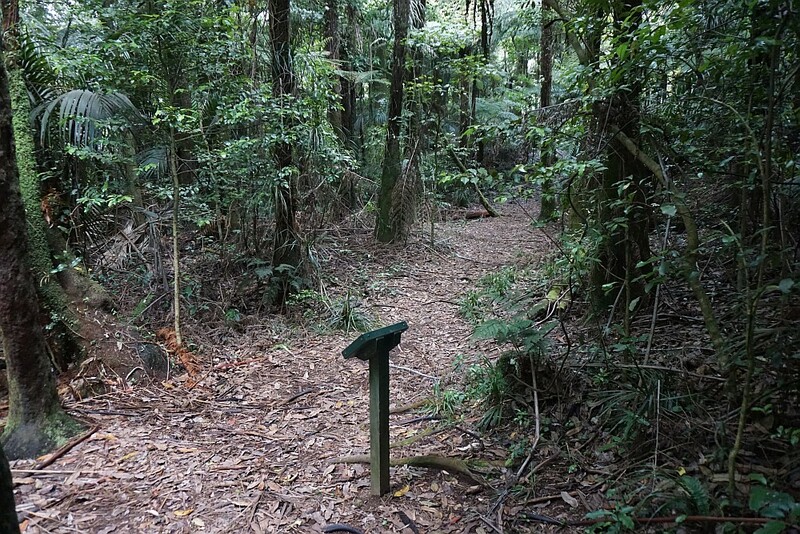 The section of Waitawheta Tramway Track used on this loop is shared with the Bluff Stream Kauri Loop walk. The walk was done in an anti-clockwise direction, with the uphill part at the start of the walk, and the easy, almost level tramway walk of about 3km taken at the end. 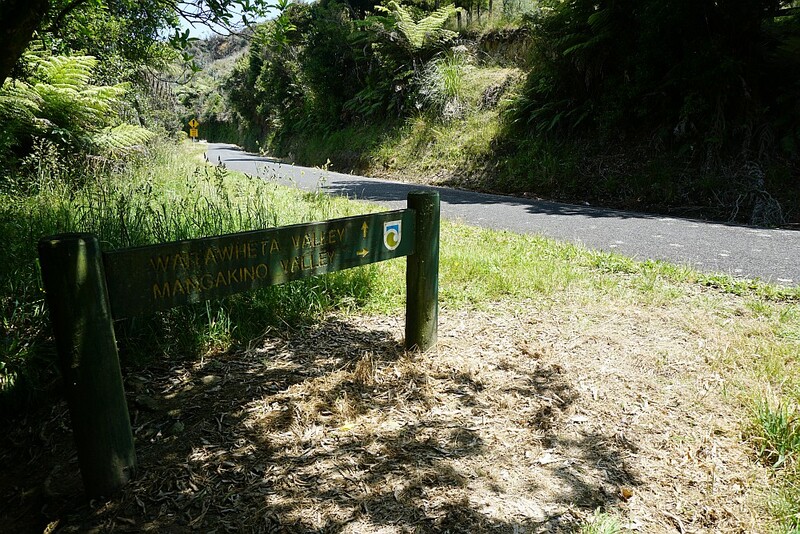 The Dean Track (shown in various places as Deam Track) starts about 120m from the carpark, with a sign on the left hand side of the road showing the starting point. The track starts with a few steps up to farmland, across the road from the sign. 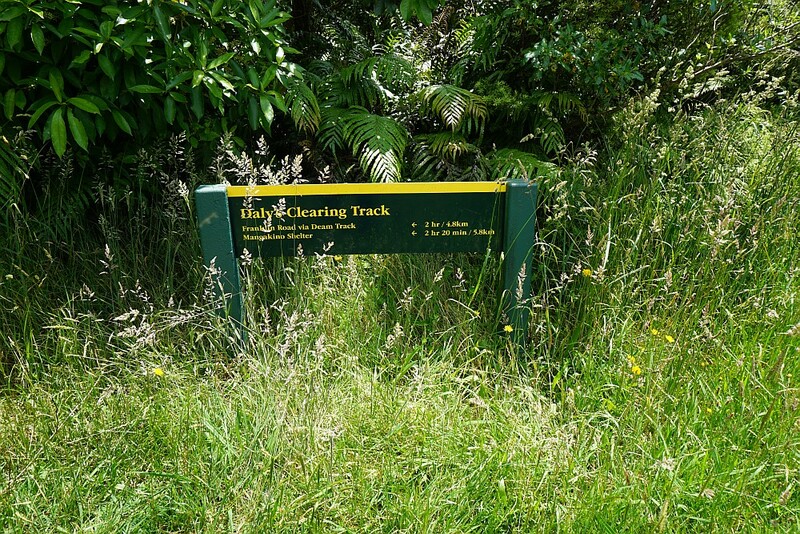 The track markers are not always easily visible, especially in the long grass. The track continues climbing through farmland for about 850m before entering the forest park. This is near the start of the climb. 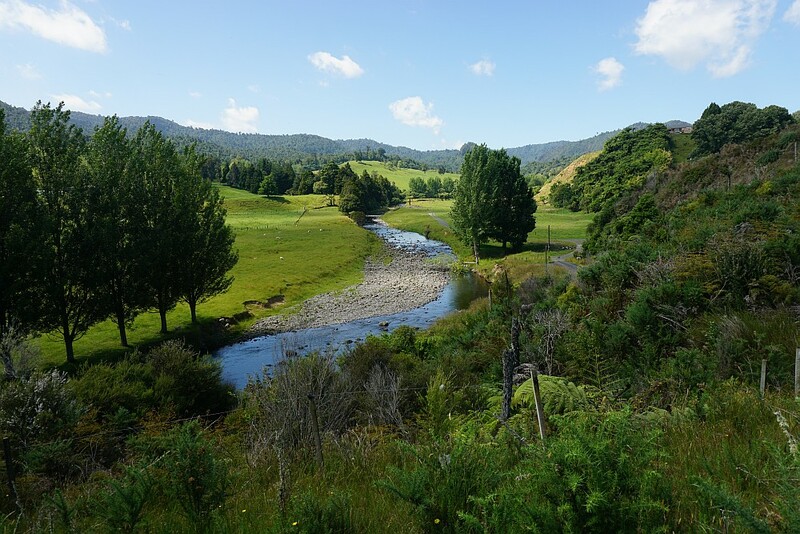 Looking down on the Waitawheta River near the start of the climb through farmland. 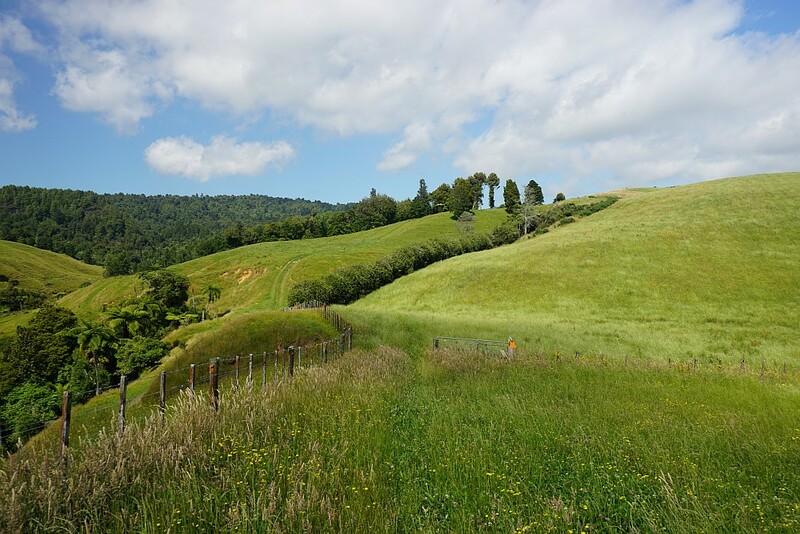 One of the track markers at about the halfway point of the climb, and looking across the Waitawheta River to the Kaimai Forest Park. The track continues through the open gate (or across the stile) and passes through the hedge by the tree to the right of centre. Looking back down the track, near the forest entry point. Entering the bush. The elevation change to this point is only about 70m from the carpark. 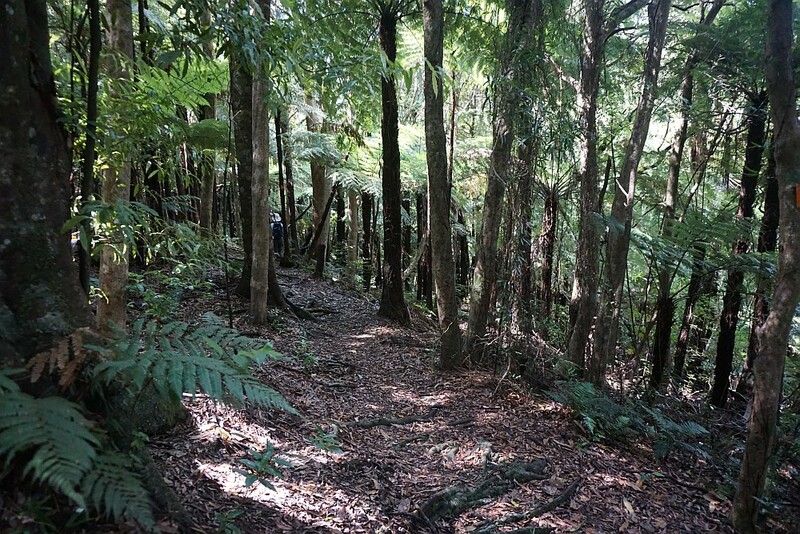 The forest canopy is quite open near the forest entry point, with an easy track contour. Parts of the track are straight and fairly level. Possibly they have been used for dragging felled logs, or as a pack track. 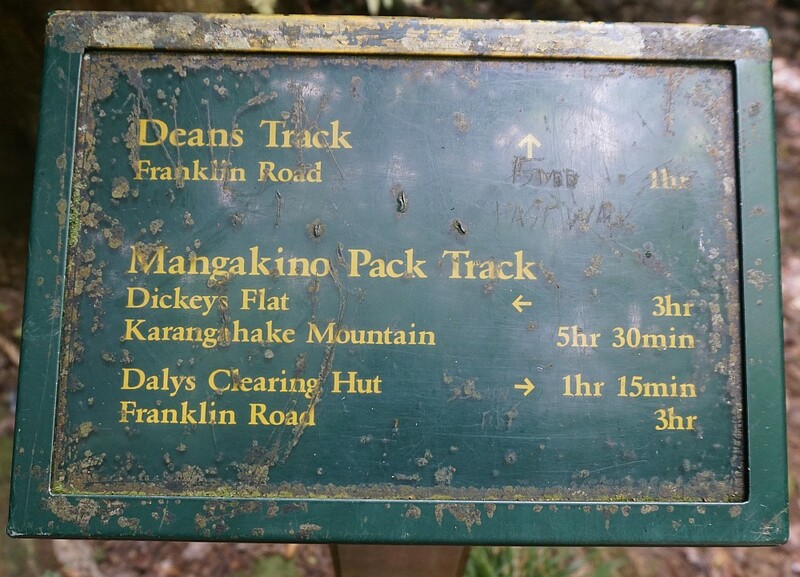 The Dean Track joins up with the Mangakino Pack Track. 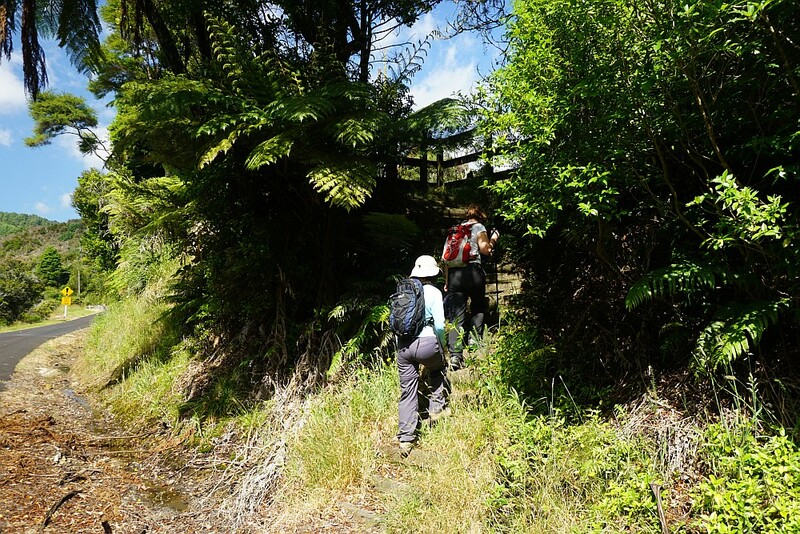 The loop walk follows the Mangakino Pack track to the junction with the Daly’s Clearing Track. 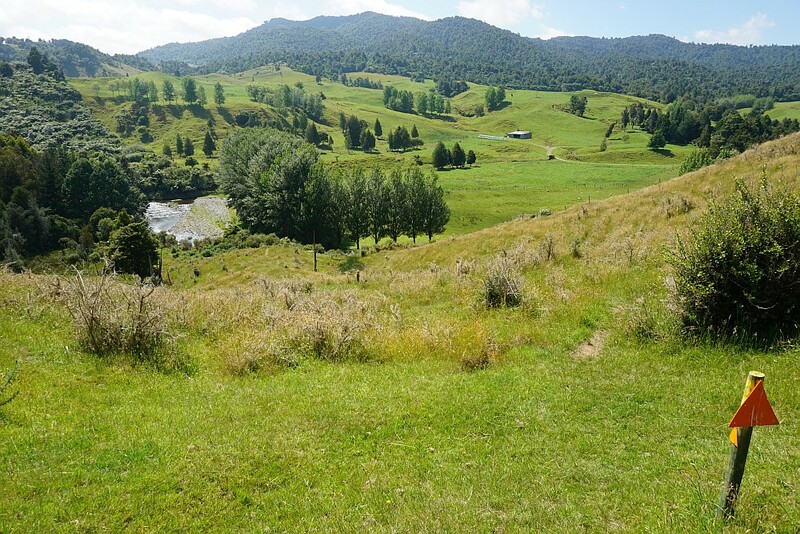 The highest point of the loop walk, about 410m above sea level, is on this track. 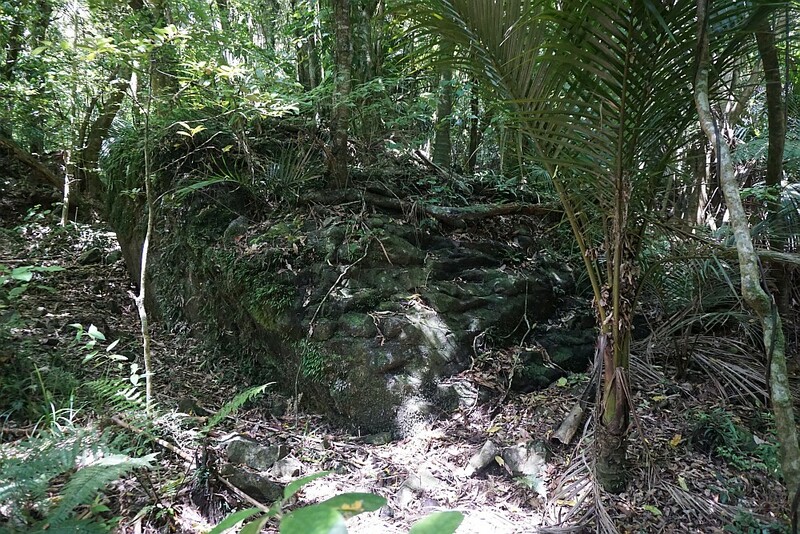 An unusual rock formation by the Mangakino Pack Track. The stones almost look like a large rock wall. 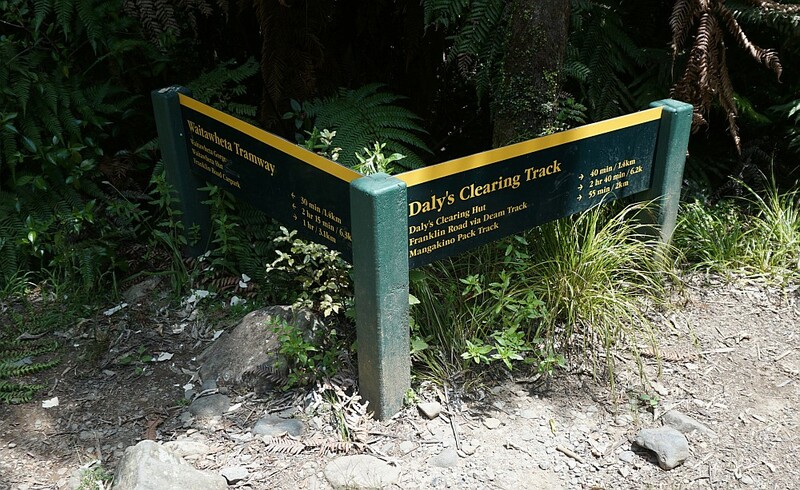 The sign at the junction of Mangakino Pack Track and Daly’s Clearing Track. According to the sign this is the halfway point in walking time of the loop walk. 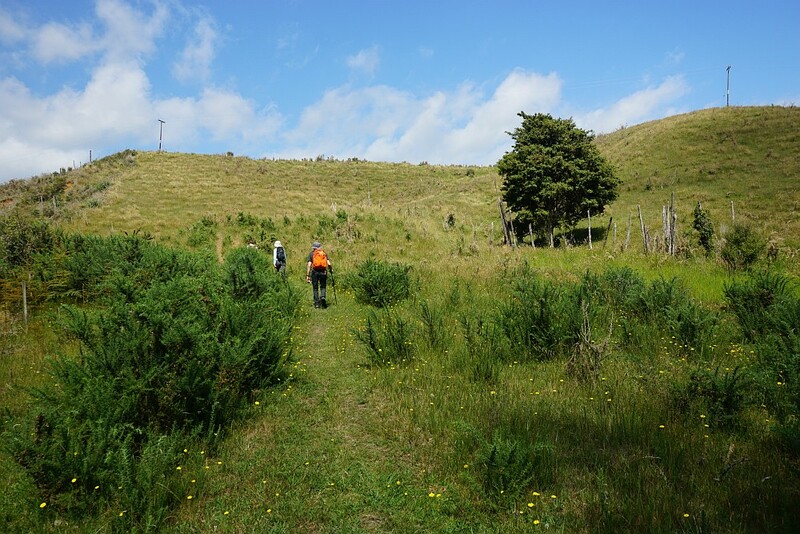 Looking back along Mangakino Pack Track from the start of the Daly’s Clearing Track. The Daly’s Clearing Hut. 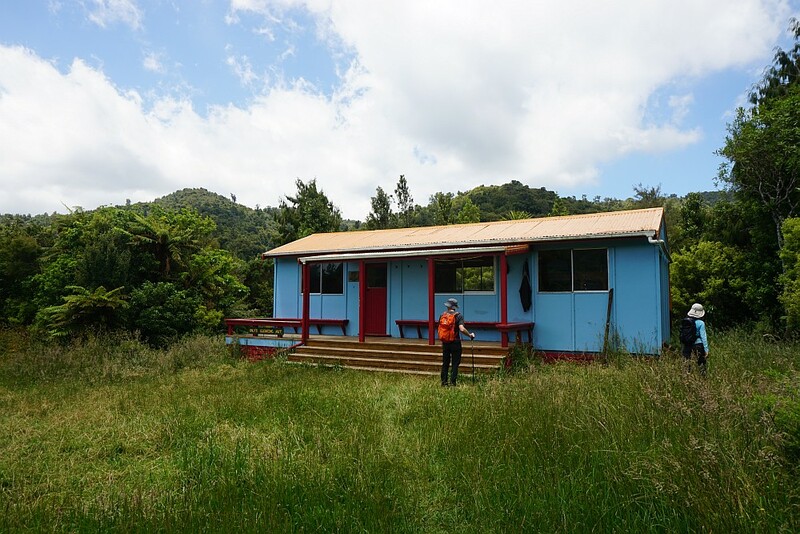 The hut has a number of bunk beds and other basic facilities. There is a toilet nearby, across the clearing. 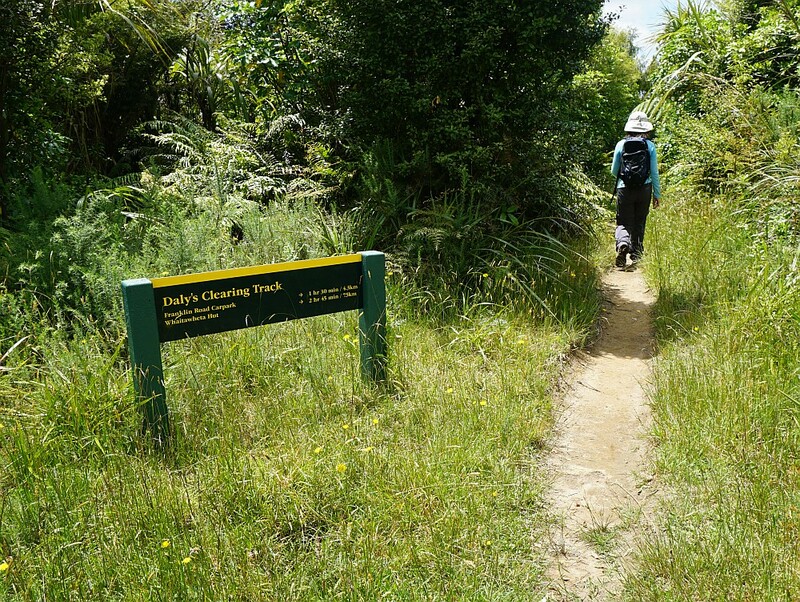 At the entry to the clearing, coming from the Mangakino Pack Track end. 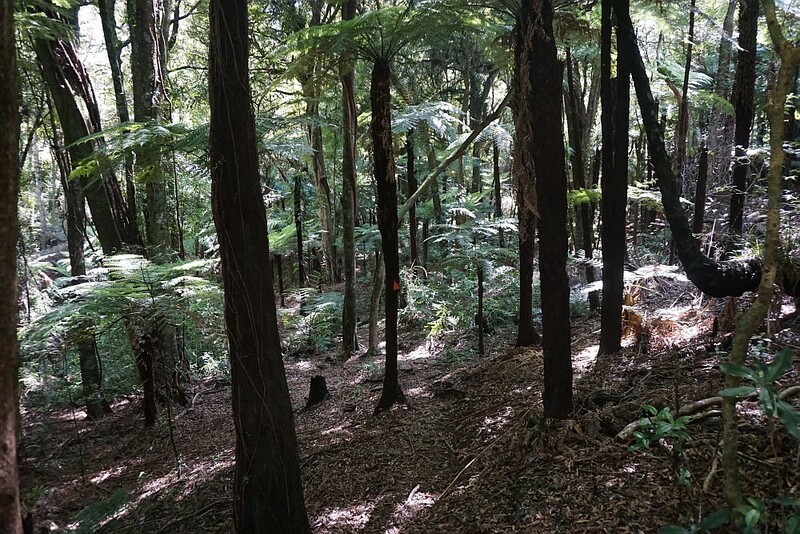 The exit from the clearing, heading towards Waitawheta Tramway. The only stream crossing on the loop walk. This was in summer, after a period with very little rain. 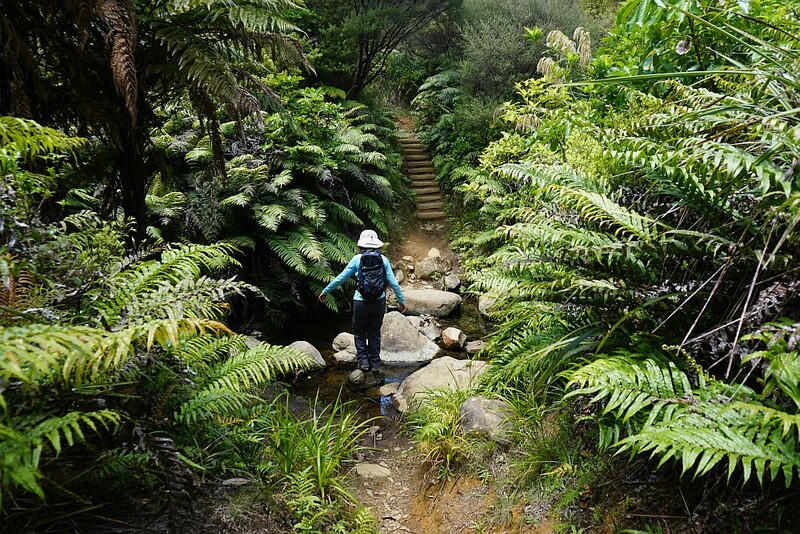 The Daly’s Clearing Track descends down a long flight of steps, similar to the ones by the stream crossing, before reaching Waitawheta Tramway. These signs are at the junction of the two tracks. 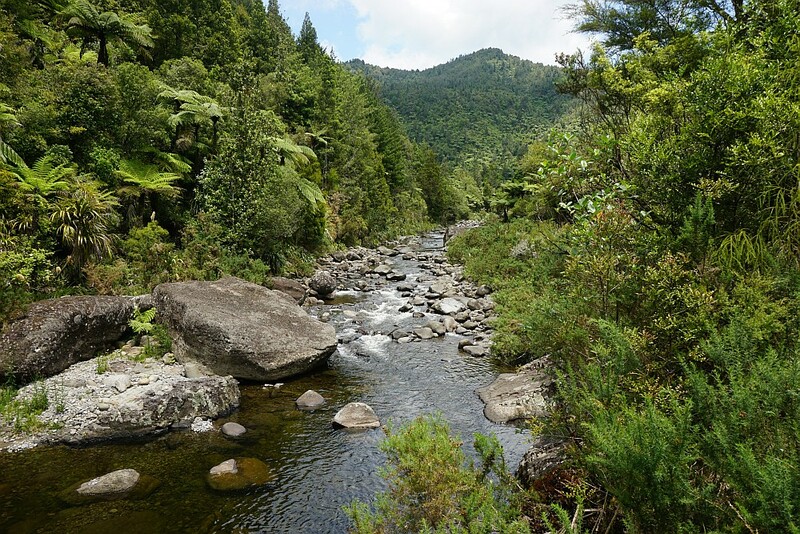 The Waitawheta River runs alongside the Tramway track. 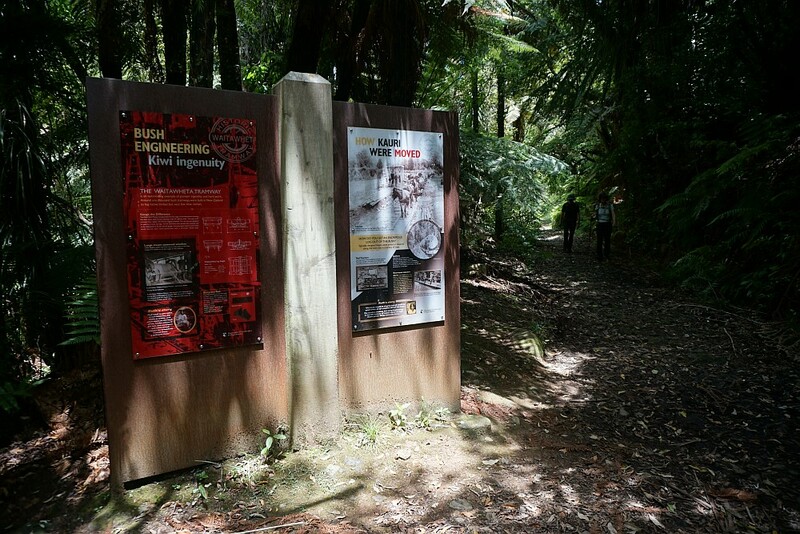 The sign at the start of the Bluff Stream Kauri Loop track, on the Waitawheta Tramway Track. The GPS tracklog shows the route taken. Total distance was about 9.2km, with a total time of 3 hours 15 minutes, including short stops along the way at the hut and for a quick snack. 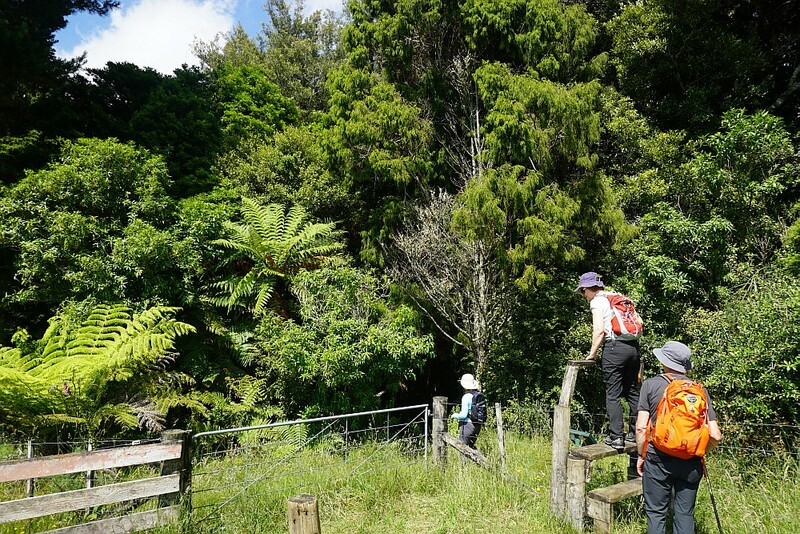 Lowest point at about 170m asl is at the carpark, and the highest point at about 410m on the Mangakino Pack Track. 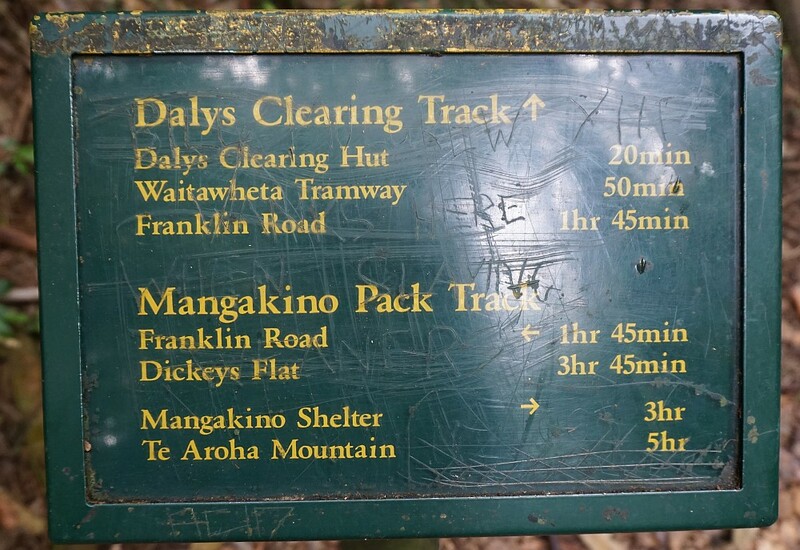 Carpark to junction 1 (Dean and Mangakino Tracks): 2.3km, 55minutes. 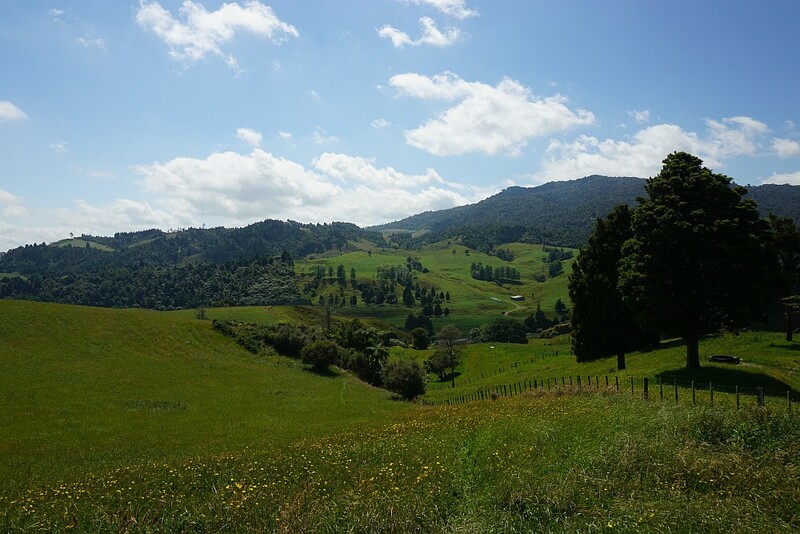 Junction 1 to junction 2 (Mangakino Pack Track): 1.8km, 40min. Junction 2 to hut (Daly’s Clearing Track): 600m, 15min. Hut to Tramway junction: 1.4km, 25min. Tramway junction to carpark: 3km, 45min. 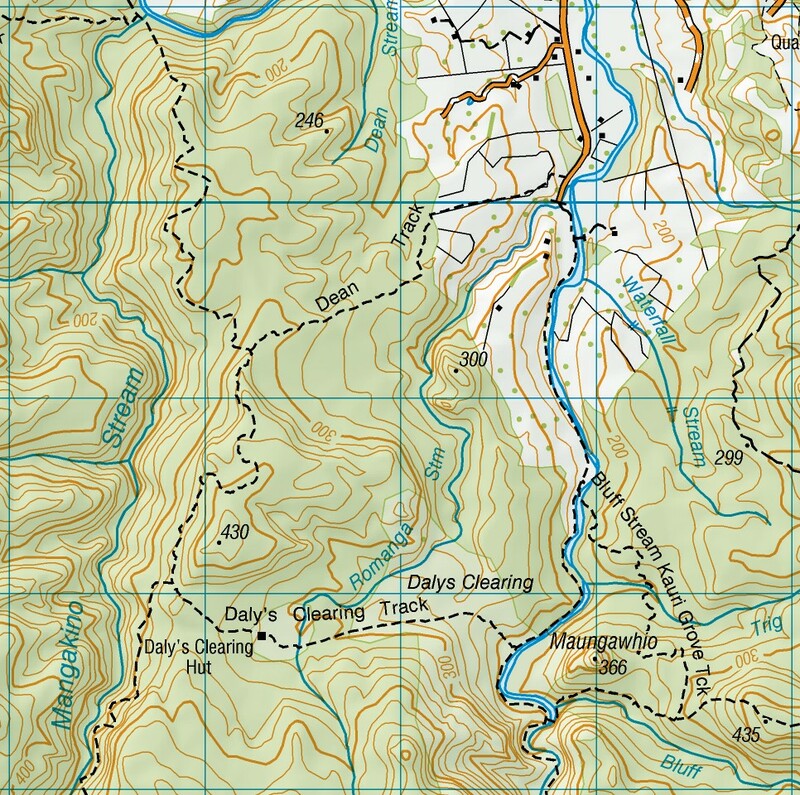 The topographic map shows the various tracks and elevations. 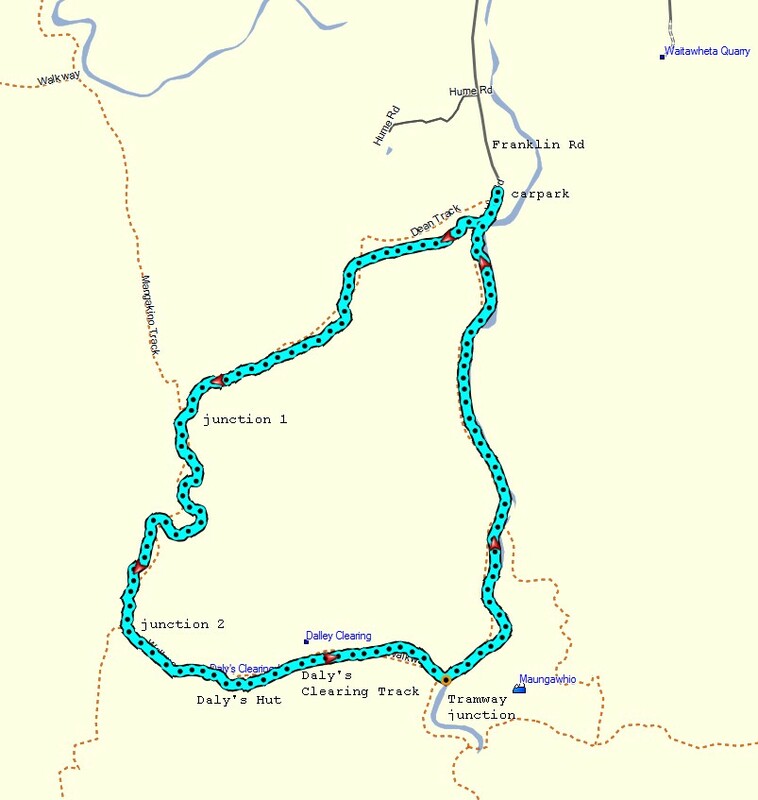 The loop track was walked on December 27, 2015.